So, here we are, together again, to discuss Dark Souls III. It’s no secret that I have a great deal of respect for From Software, partly because of their long history of making interesting (if not always mechanically ideal) games, and partly because they’re a company interested in their own vision over all else, which can be rare in this day and age. Because of this, it’s still kind of surprising that the Souls series has taken off as heavily as it did; what started off as a third person spiritual successor to King’s Field somehow became a borderline Triple A franchise, and that’s still astonishing when you consider how poorly the King’s Field games were received in the US. 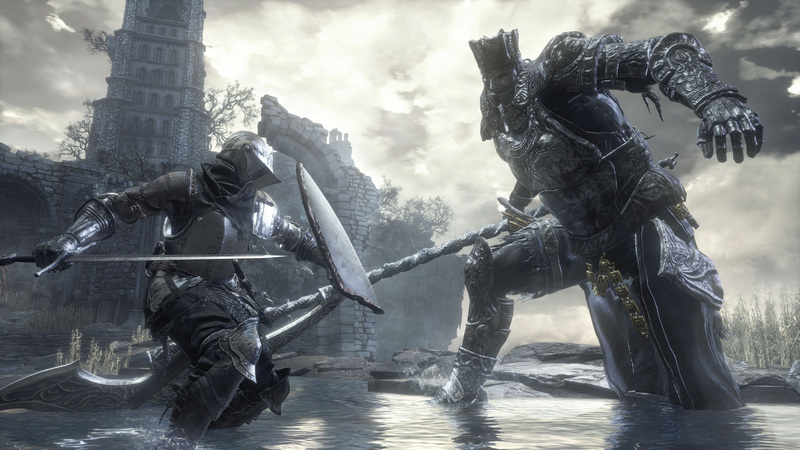 That said, the prior entry in the series, Dark Souls II, felt like it was missing something in comparison to its predecessors; franchise director Hidetaka Miyazaki had moved onto developing Bloodborne at the time (which also felt like it was missing something), and Dark Souls II suffered a bit for it. That’s not the case this time around, fortunately, as Dark Souls III features Miyazaki’s influence, and without spoiling anything, the game is better for it. Put simply, Dark Souls III is a fine return to form for what might potentially be the last game in the series for a while, and it’s among the best in the franchise… but at the same time, it’s also a good argument for why the franchise could use a break. The plot of Dark Souls III pretty much starts off the same way as the prior games do: you’re dead, but not exactly, thanks to a complicated series of events, and you’ve been put back into the service of fate to fix the problems preventing people from staying dead. Interestingly, however, this time around you’re not Hollow, as in the prior games (though that is a thing that is going on in the world), but rather you’ve lost the Ember of life; basically, instead of turning into a Deadite on death, you still look normal, but you’re still dead inside without assistance. 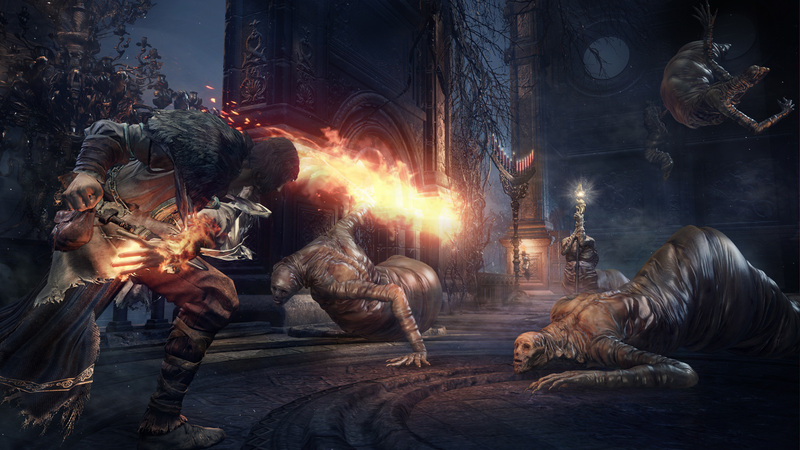 After digging yourself out of your own grave and acclimating yourself to the world, you’re put on the task proper: in this case, you’re expected to bring down the Lords of Cinder in hopes of bringing salvation to the world. This amounts to what it always amounts to in the series: murder a bunch of super-strong and most likely insane entities, all in service of saving the world and bringing down whatever caused it in the first place… or maybe not. 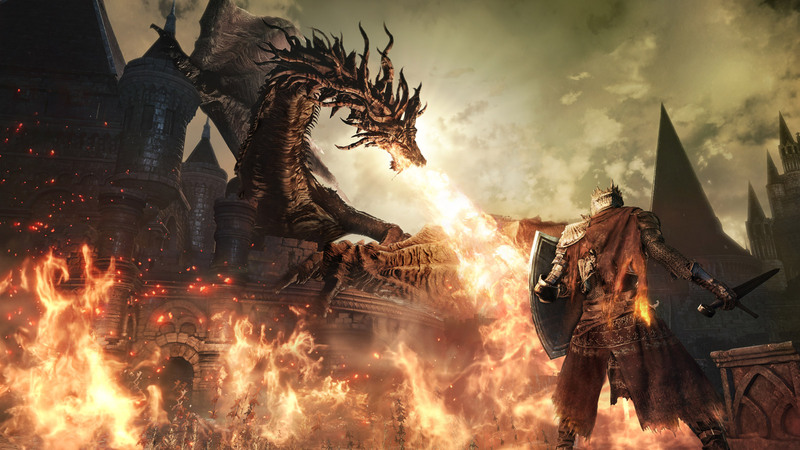 What’s interesting about Dark Souls III, narratively, is that while prior games in the series have generally been fairly minimalist in their narrative such that spoiling the narrative requires a good bit of extrapolation, this time around there’s a surprising amount of things to see that will be shocking to fans, which gives the narrative a surprising punch that prior games have lacked. The prior games certainly had interesting narratives, to be sure, but the experience was often shocking because of the aesthetics; this time around, however, there are actually several shocking narrative turns and revelations as you play, even with the minimalist narrative, and the game is richer for it. You’re still left to fill in the blanks as needed at various points, of course, so you don’t have to worry about the game becoming windy with dialogue or anything, but it is worth noting that the game has more than a few surprises in store for long-time fans to enjoy. 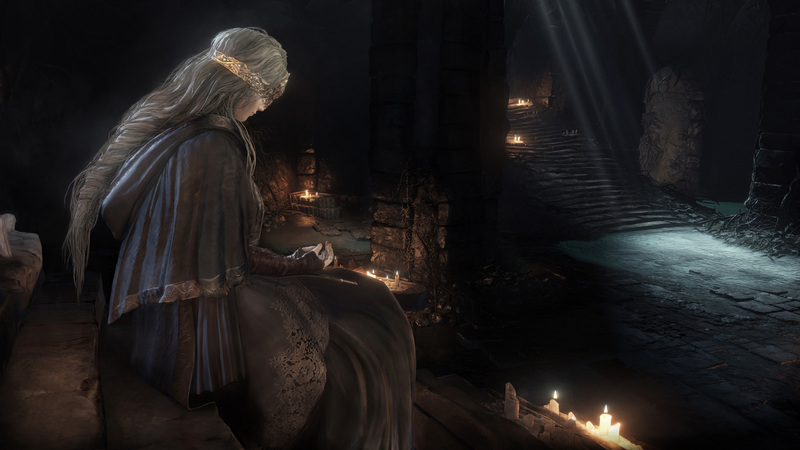 As with its predecessors, Dark Souls III is a visually stunning product, due in large part to its ability to evoke a very specific sort of emotional response through its visual setpieces. The entire game is based around attempting to craft a specific feeling of despair in the player; whether it be through dilapidated cities, desecrated crypts, defiled churches, or haunting forests and lakes, the visual design of the game world aches with pain and loss. Stylistically, the game tends to fall back to the sensibilities of the first game, balancing a game world that’s both medieval and horrifying in equal measure, and honestly, the shared balance between the two makes for a more compelling experience than some of its predecessors. The move to the PS4 has improved the texture count noticeably this time around, giving the game an appearance that manages to outdo its predecessors while also mostly keeping the framerate in check, and the animation quality of the entities in the world is as amazing as ever. There are some definite framerate issues that pop up sporadically, mind you, but the game still manages to avoid the massive framerate drops of Dark Souls, so while there are some technical issues here, they’re mostly minor, and (thankfully) rarely pop up in combat. Aurally, while the game still works with a fairly minimal amount of voice acting (all of which is excellent) to get across its narrative, the use of music to convey tone has ramped up considerably; the game makes far more use of musical pieces than ever, and it does so expertly, surprisingly enough. The boss battles in particular are often cast with some amazing music, and the very first boss battle you see is, in all honesty, an outright amazing experience because of its score. On the downside, however, the game reuses some of its visual and aural assets from prior games, and while this doesn’t detract from the experience much on its own, fans will definitely notice this as they play. 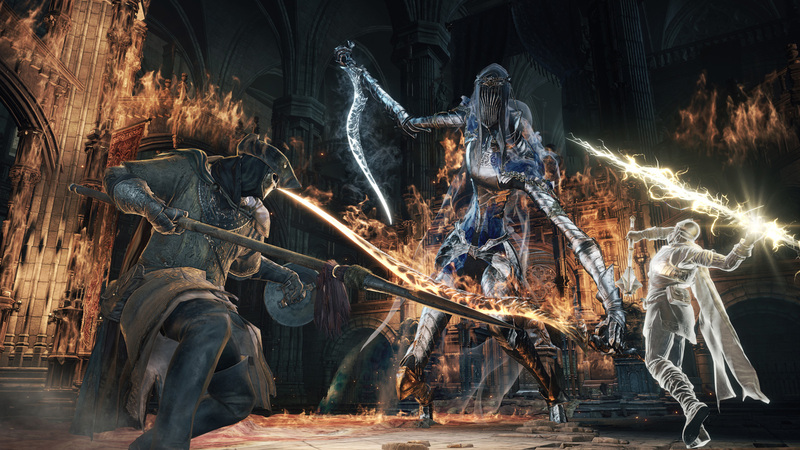 For those who have played any of the prior Souls games, the basic mechanics of Dark Souls III are going to be very familiar and easy to work with, such that you can basically skip the next two paragraphs, but for those who missed the prior games (or are coming in from Bloodborne), some explanation is in order. As one might expect, the left and right sticks control movement and the camera, respectively, but combat is relegated to the triggers and bumpers. In most cases, the left and right bumpers are either weak attacks or normal actions, meaning that you’ll perform normal attacks when wielding weapons, cast spells when holding talismans, block when holding a shield, and fire an arrow when holding a bow or crossbow. The triggers perform harder strikes and alternate actions, meaning that you’ll perform more exaggerated and unsafe attacks when wielding weapons, strike when holding talismans, parry or strike when holding shields, or switch arrows and bolts when wielding bows or crossbows. What sort of weapon or item you wield will dictate what sort of effect the triggers and bumpers will have, so experimentation will be helpful when you acquire new items, as they may not do the same things even if they’re same types of weapons. The face buttons, thankfully, are more static in their functionality; X button interacts with things in the game world, Circle allows you to backstep and dodge when pressed or run when held, Square uses whatever item you have armed at the moment, and Triangle switches from one-handed to two-handed stance with whatever weapon you have armed. The D-pad allows you to cycle between armed spells, items, and left and right hand equipment, the Options button brings up the in-game menus for changing equipment or quitting the game, and the touchpad can be used for both menu access and using gestures when meeting other players, or for your own amusement. The controls can take a bit of getting used to at first if you’re not acclimated to them, but thankfully, the game puts down all sorts of explanation messages through the first zone to give you an idea of how things work, so you’ll be able to get the hang of things sooner rather than later. A big part of how the game works revolves around the gear you use, as you’ll find an extensive volume of weapons and armor to utilize and improve, and understanding how it works is the difference between winning and getting creamed. Each piece of gear has its own unique stats that contribute to how it works, so armor has defensive properties, weapons have defensive and offensive properties and so on. They also have a set weight that contributes to how well you can move around while using them (heavier gear makes it harder to move effectively), and weapons often have statistical requirements to be used and stats that can directly influence how much damage they deal, or elements the weapon deals in place of stat bonuses. Finally, they also drain some stamina as you use them, which is measured by a bar beneath your health; stamina depletes when you perform various actions (attacking, dodging) and when it runs out, you’re without options until it refills in a few seconds. You’ll also be able to improve your stats using Souls, which is the currency of the game; defeating enemies and using soul items imparts Souls to the player which can be used to buy items, perform services or level up your statistics as needed. There’s a catch, though: any time you die, all the Souls on your person are left where you died, and you’ll need to collect them from the point of death. If you make it back and collect them you’re good to go, but if you die before making it there, those Souls are gone forever, making every death a major risk. This is a big part of what makes the Souls series what it is, as watching yourself lose a level (or more) of Souls because of a simple mistake is a big part of what drives the game, for better or worse, and you’ll definitely not only have this happen, but spend more than a few hours swearing like a sailor when it does. To supplement this, you can utilize bonfires throughout the game world as home bases of sorts, allowing you some brief respite from the horrors in the world. 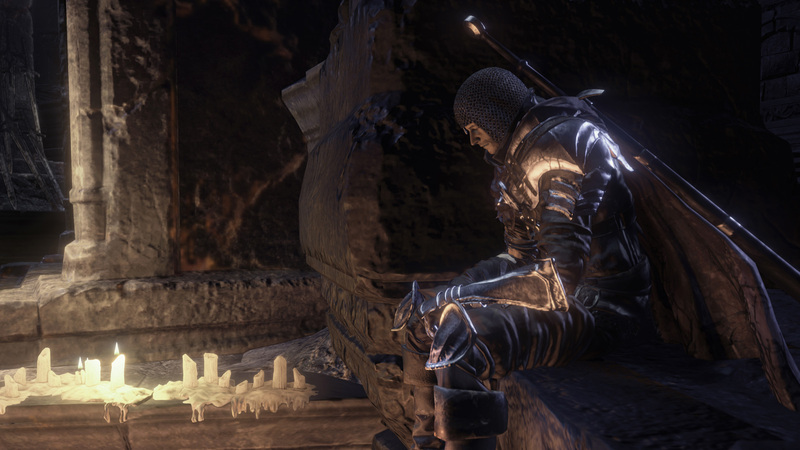 You can rest at bonfires to replenish your health and health items (Estus Flasks), as well as store items in a bottomless box or teleport to your home bonfire as needed, so you always have access to everything you need, so long as you make it to the fire alive or use a Homeward Bone to teleport there. For those who are coming into the series with some experience, welcome back. 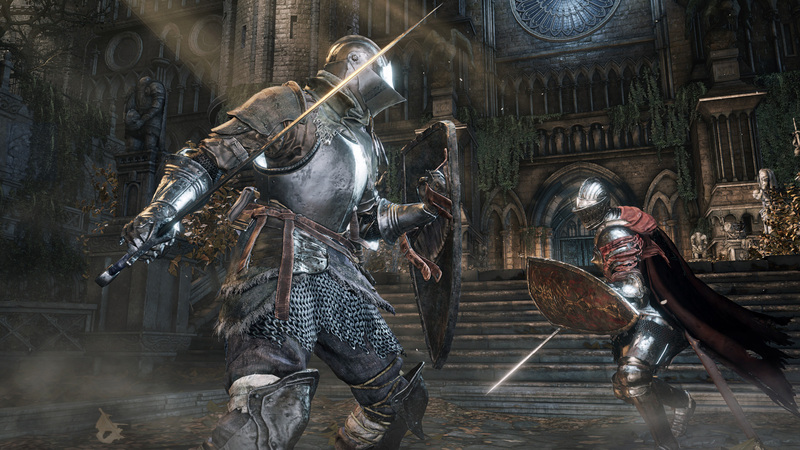 Let’s talk about what’s new in Dark Souls III. The first thing that’s probably worth noting is that the Humanity system has changed noticeably. In prior games, you were Hollow and needed to use Humanity in order to go back into human form, but this time around, you’re generally in human form from jump. Instead, you’re Ashen, meaning you’re lacking the flame of life (essentially), so you need to utilize Embers to bring your true humanity back. In theory, this sounds like a straight palette swap, but the mechanics are a little different. For starters, instead of turning from a leather-faced zombie into a person, your usage of an Ember is denoted by your body gaining a flame effect to show your flame of life. The game also uses the decreased life bar mechanic from Demon’s Souls as a motivator to keep an Ember active, as you lose part of your health bar when in Ashen form, though your appearance doesn’t change. 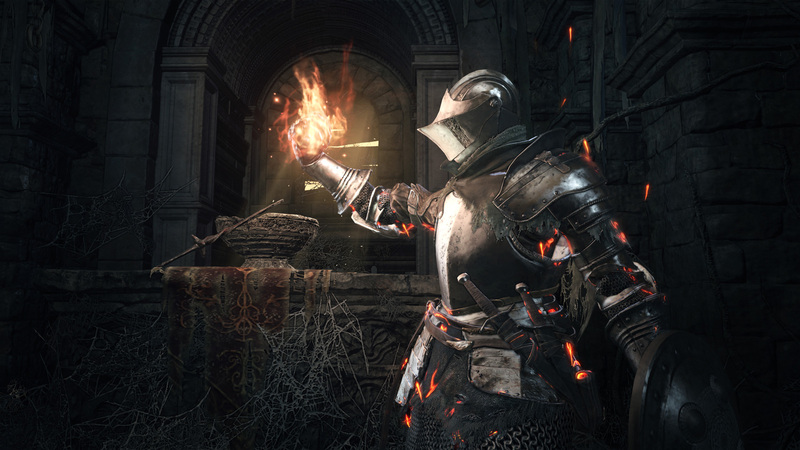 Beyond that, Ashen players also can’t use (or even see) summon signs in the game world, similarly to Hollow players, but it’s also worth noting that Embers don’t act as healing items in the same way as Humanity; you can’t use an Ember when you have an Ember active, so no using Embers to heal up folks. Finally, the game also employs the Demon’s Souls system of giving you a free Ember effect upon beating a boss if you’re Ashen, so you can get a free boost if you can beat a boss while Ashen. All that said, it’s worth noting that Hollowing is still in the game, but not as a default mechanic; you’ll meet an NPC (potentially) who can increase your level five times for free, which increases your Hollowing each time you die as a consequence. This doesn’t seem to have much of a significant impact mechanically (though healing it allows you to get more free levels… well, maybe not free at that point since healing it costs Souls), but it’s still here as a mechanic, so keep it in mind. The Estus system has also been retooled again, though players of Dark Souls II will recognize most of it. As in that game, you can only increase your total Estus Flask supply by finding Estus Shards and Estus power by finding Bone Shards, and you can only find a small amount (around twelve or so) that replenish consistently no matter what bonfire you visit. Interestingly, however, Lifegems have been excised entirely, and with the removal of the ability to use Embers as a healing item, you’re committed to Estus and nothing else, which is a new challenge for players to deal with. Further, in addition to your health and stamina bars, players now must also content with FP, which measures your ability to perform magical actions, in another return to Demon’s Souls. However, this doesn’t just influence spell or miracle casting, but also your ability to perform Battle Arts, which are weapon skills that also drain FP; using them requires them to be in your left hand (either through normal equipping or two-handed usage), but they can offer heavy damage attacks or special buffs, making them useful. The catch is, you can now equip Ashen Estus Flasks, which replenish your FP, but you have to share each from the total pool, so if you have ten total, you can spread between the two up to the total of ten. This is a challenging mechanic that offers additional risk considerations as you play, especially for caster builds who would be used to having set volumes of spells to use; for example, do you take more Ashen Flasks to spam powerful spells, or Estus Flasks to keep yourself alive? 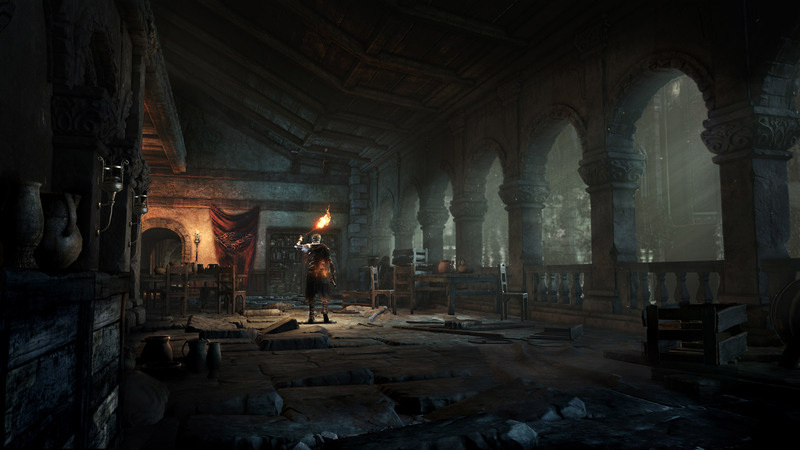 Beyond the two elements above, the bonfire teleportation mechanic from Dark Souls II makes a return, meaning you can teleport from any bonfire to any bonfire you wish, but if you want to perform tasks you need to return to your home base to do so. The base initially comes with a Fire Keeper, who handles leveling up and healing Hollow status, as well as a blacksmith, a merchant and a couple NPCs who hang around to whine or convince you to do mean things. As you play, though, you’ll discover more NPCs who can move in (or just show up to advance plots), allowing you access to a Pyromancer, a Mage and a Healer of sorts who can sell you the appropriate magic. However, nothing in the game world itself directly connects to your hub, so while the rest of the world is wholly connected, your hub stands alone. The repair system from Dark Souls II also makes a return, meaning that your gear will slowly degrade from use, but will instantly spring back into full form once you visit a bonfire unless it’s broken, at which point you’ll need the Blacksmith to assist. 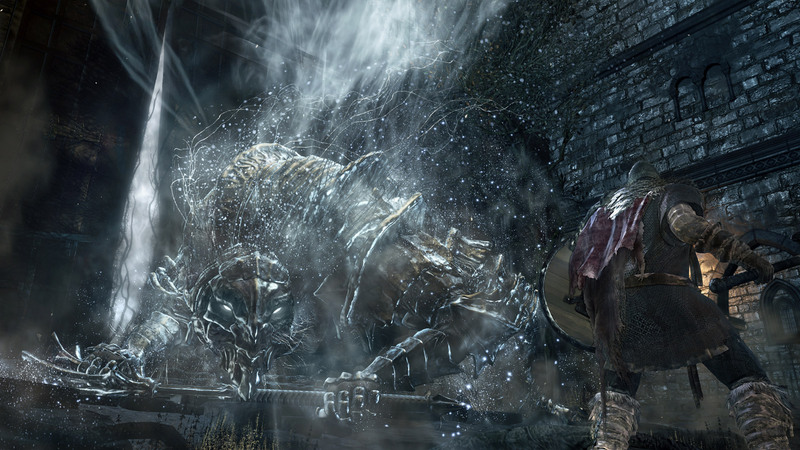 This time, however, your gear is extremely hardy, and you’ll rarely need a Blacksmith’s services unless you spend lengthy periods of time away from bonfires, making the feature far more useful than it was in Dark Souls II, where gear broke far more commonly in comparison. There are a few other, less significant (but still important) changes to mention that impact the game, if not as significantly as those above. For one thing, enemies no longer cease to repopulate when you visit a bonfire as they did in Dark Souls II so you won’t be able to depopulate a zone to make a trek easier. 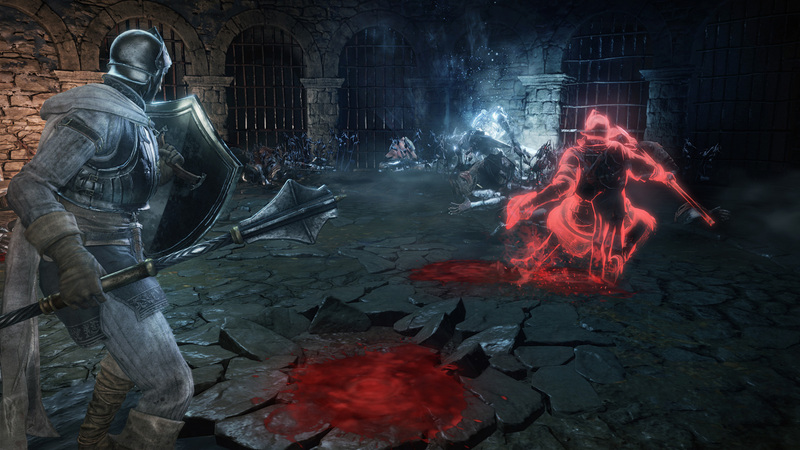 For another, online requires you to have an Ember active, but allows for the standard “summon friends and be invaded by enemies” options as before, though there has been some tuning that allows for a more cooperative experience and also reduces invasions (unless you want to be invaded constantly). Covenants have also been modified a bit, as several new Covenants have been added to the game, several of which are based around invading players to acquire items from them to improve Covenant rankings. Covenants are no longer one at a time, however; you’re given a Covenant item on joining one, and you can equip the one you’d like to use at any time, so you’re not beholden to one group and can play as you wish without penalties for departing a Covenant to join another. You can also just play offline if you’d rather avoid the whole invasion aspect of play, but the game offers a fairly extensive amount of options for online play (including an infinite use Red Eye Orb for invading to your heart’s content) so if you’re into this thing there’s a lot here to love. 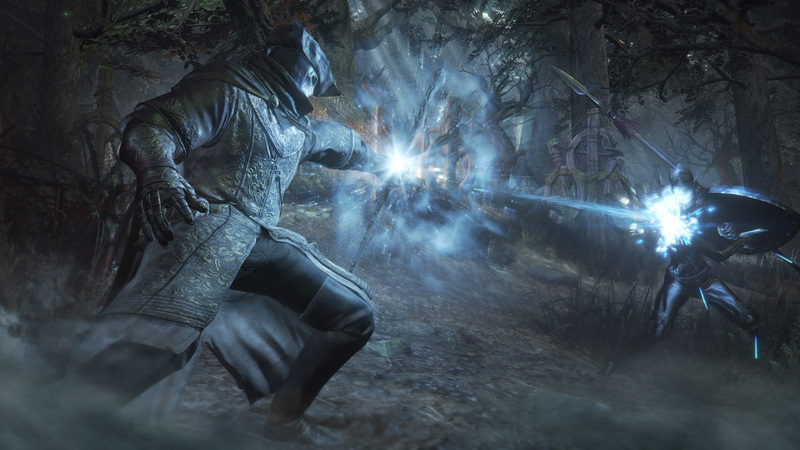 Finally, it’s worth noting that the pace of combat has been increased slightly; it’s not Bloodborne, but even players who tend to play defensive, high-armor builds will find that they need to dodge like mad in some fights, and since you can’t upgrade armor, the game tends to push you to lean on your reflexes rather than defensive tools to survive. 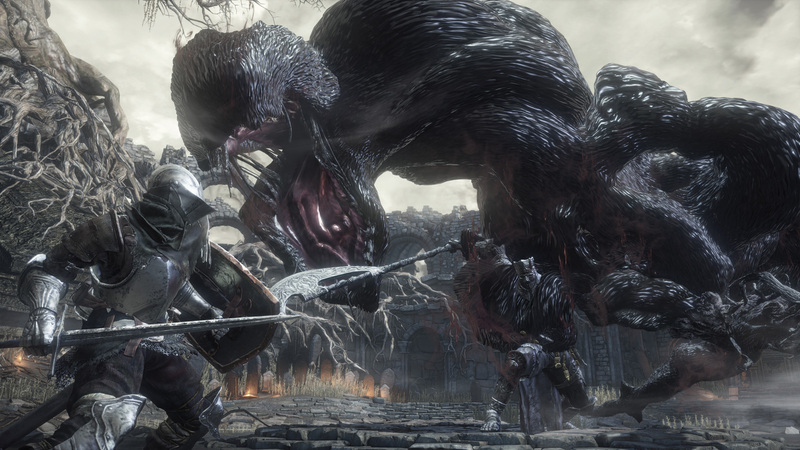 Depending on how quickly you pick up on the mechanics of Dark Souls III and how much time you spend trying to do things, you’ll likely get through your first playthrough in anywhere from thirty to a hundred hours, but there is so much more to the game than its first playthrough. The first thing to consider is that a little over a third of the game is purely optional content, meaning that you might well miss entire zones on your first run, so you’ll have plenty of incentive to explore and return to the game to see everything to see. 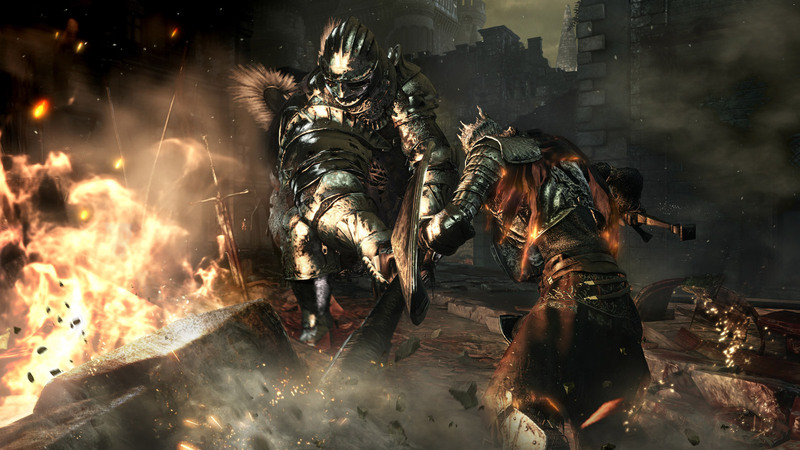 Further, Dark Souls III allows you the option of multiple playthroughs, allowing you to carry over your levels and non-important gear to a brand new playthrough… that’s also been increased in difficulty to add to the challenge, so skilled players can see how far they can get and how much they can take, as each time you do so the difficulty increases again and again. 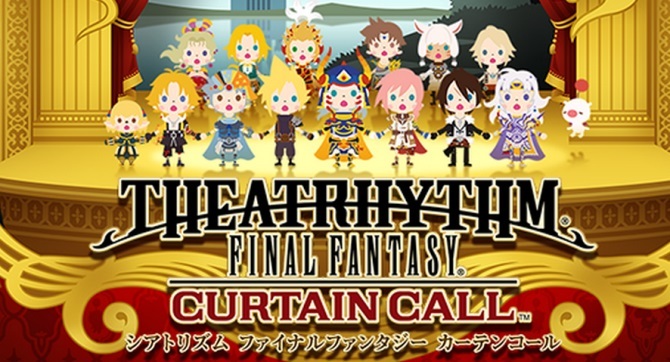 Additionally, the game features multiple endings (one of which is incredibly convoluted, as is the Souls way) that will take you some time to see through, as well as a full complement of Trophies to unlock by performing various tasks and collecting various things, if that’s something you’re into. Honestly, you could easily spend hundreds of hours on the game doing everything there is to do, and for fans, that’ll be a big positive to keep them coming back. That said, this being a Souls game, it’s worth noting that Dark Souls III basically has the majority of the same problems the franchise has always had, and absolutely none of them have been fixed for this game. I’m not talking about the difficulty, because honestly, that’s a part of the charm of the series and at this point you should have an idea as to whether it’s for you or not (and the balance here is quite well scaled this time around overall). Rather, the game still has the same collision detection issues it always has (IE backstabs can miss when hit perfectly but hit when well off to the side), the same camera angle issues it always has (getting stuck on walls or large bosses) and the same environmental goofs it’s always had (getting stuck in the environment or on objects while moving), and while they’re not constant, fans know exactly what I’m talking about. None of these will ruin your experience, but five games in you’d think something would be done to resolve this by now. The game also has an odd issue with bonfire and shortcut placement, as some bonfires are placed ridiculously close together while some shortcuts simply… aren’t; it’s a minor concern, but it’s confusing from a pacing perspective, and the franchise rarely has this issue. The biggest problem overall, though, is that the game as a whole is among the best in the series structurally and mechanically, but you can tell at this point that From is burned out on the series, as the game largely has very little new to showcase at this point. You’ll see concepts that you’ve seen in all four of the prior games, and I don’t mean simple gameplay elements that are shared between the games, either. As an example, there’s a cage you can climb into to get to a hidden location, which Dark Souls and Bloodborne both did variations on, and while it was an interesting concept the first (and arguably the second) time, at this point it’s almost obvious this is a thing you can do as soon as you see it. Put another way, the majority of the setpieces are evocative of the prior games, to the point where you can pick them out from memory as you play; High Wall of Lothric borrows from Undead Berg, for instance, and you’ll see zones that heavily borrow from Demon Ruins, Darkroot Garden and more. The game certainly isn’t bad by any means, but this was much less of a problem in King’s Field or Shadow Tower because From gave those games time to breathe before revisiting them. Here, that’s not an option, and the end result is a game that’s amazing, but also very, very familiar. 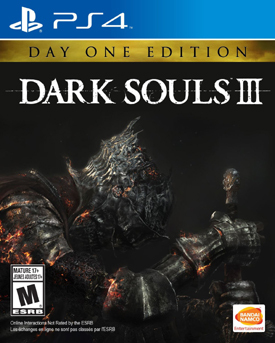 Honestly, if Dark Souls III is going to be the last game in the series for some time, it’s the best possible game to go out on, as it’s among the very best in the series in all respects, but it also shows that the series has hit a wall creatively and needs a little time to recharge before hitting store shelves again. Don’t misunderstand that to be a condemnation of the game, as it’s still a masterwork, between the vague but surprisingly evocative narrative, the simply inspired visual and aural aesthetics and the gameplay that’s just as sound and challenging as it ever was. The game manages to find a balance between the systems of the prior two games in the series in how it handles its mechanics, while also reaching back to Demon’s Souls on occasion, and the end result is gameplay that’s familiar to fans while also offering several interesting changes, as well as the depth and difficulty the series is known for. 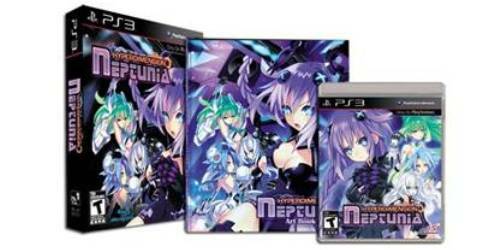 There’s some mild slowdown to the PS4 version in places, and the game still has the same issues the series is known for with collision detection, camera hiccups and environmental collision, but perhaps the most notable issue is that the game feels like it’s borrowing a lot from its predecessors, leaving it feeling more familiar than it should. Dark Souls III is still an easy game to recommend, for certain, and it’s on the short list of the better games released this year, make no mistake about it, as it’s still an exceptional experience from beginning to end. That said, it’s clear the series could use a bit of a break, so here’s hoping From Software takes some time away to work on other things before coming back to it, as the series and From feel like they could both use it. Dark Souls III is an amazing experience in the same way its predecessors have been, as it’s a challenging and powerful experience that will drive you forward even as it beats you down… but it’s an experience that tends to run on elements you’ve seen before, for better or worse, and it lacks the true uniqueness of its predecessors. Make no mistake, the game is still amazing, between the surprisingly engaging yet still minimalist plot, the exceptional visual and aural aesthetics that combine sword and sorcery with pure horror with ease, and the complex but natural gameplay mechanics the series is known for. The framework of the game has been fine-tuned with elements from both prior Dark Souls games, as well as a bit of Demon’s Souls, to create an experience that’s instantly familiar, but full of new elements to learn and experiment with. That said, the game has some mild slowdown hiccups on the PS4 in places, as well as the same hit detection/camera/environmental navigation concerns of its predecessors, though the worst thing is that the game simply feels like it’s borrowing a lot of its beats from prior games in the series, leaving it feeling less inspiring and more familiar than it should. Dark Souls III is still an easy game to recommend, especially if you’re a fan of the franchise, as it’s still an amazing experience from top to bottom, it’s just one that shows the series needs a bit of a break. If this is (hopefully) the last game in the series for a while, it’s an amazing game to go out on, but it’s also an example of why the series could use a bit of a rest. 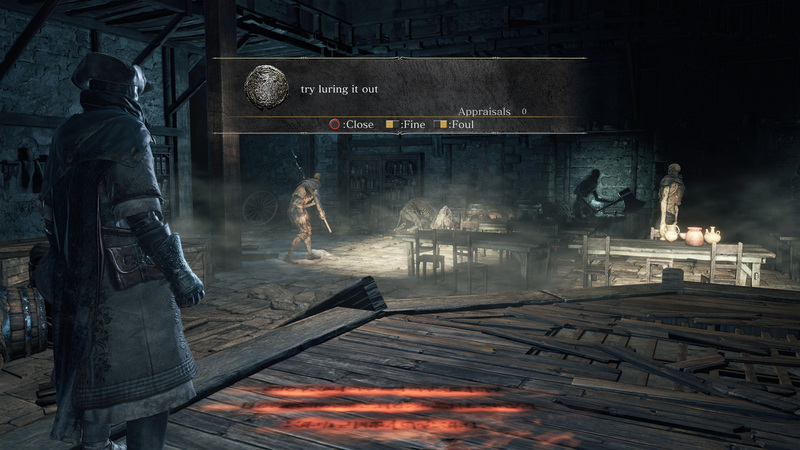 Things to do in Lothric when you’re dead… is that an Armor For Sleep Reference? Makes sense. Never big on Zevon though, respect, but doesn’t hit my ears quite right.